Geotube® containers have been used for more than 150 miles of shoreline protection worldwide to limit erosion and damage caused by storms, ice, waves and human activity. In each of these applications, project planners evaluated and selected Geotube® containers for their strength and resilience against conventional approaches, such as retaining walls and timber structures. During her presentation, Robin showcased a number case studies where Geotube® was selected to replace conventional alternatives. For example, a property in Round Lake, Ontario is using a single, 100-foot long Geotube® container as a long-term solution to withstand ice push. The property owner approached Bishop Water after learning that many neighbours had implemented conventional solutions for erosion control, including armour stone that were eventually damaged by winter ice push. Unlike other rigid shoreline protection structures, the Geotube® container installed at this property is unaffected by weathering or erosion, even after three winters. It’s filled with about 100 cubic yards of sand, to a height of about 3.5 feet and width of seven feet. It’s bulk and rounded contour makes it nearly impossible for ice to shift it and compromise the integrity of the shoreline. The Geotube® container is also more aesthetically pleasing than alternatives since it’s covered with soil and provides a gently sloping surface that resembles the natural shoreline. 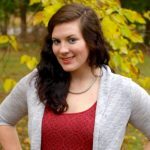 The 2017 Latornell Conservation Symposium was held in Alliston, Ontario from November 21 to 23, 2017. 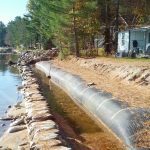 Learn more about the use of Geotube® containers for shoreline protection in Round Lake, Ontario. Learn more about Geotube® Shoreline Protection Systems. Contact us to discuss your shoreline protection project.